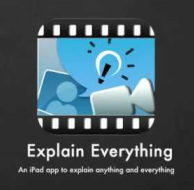 Explain Everything ($2.99) is an app that allows you to import photos and PDF’s from Dropbox, Evernote, Email, or iPad cameras. You then have the ability to record on-screen drawing, annotation, movement, and audio via the iPad microphone. Completed projects can be exported and shared with teachers, students, parents, and others to foster learning.